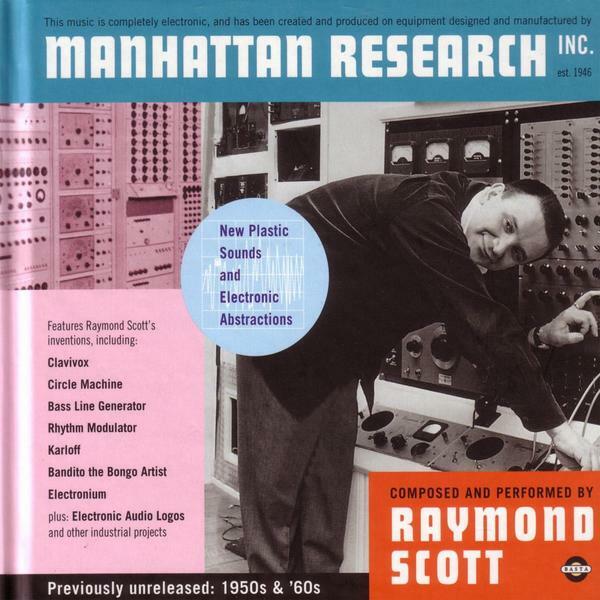 This is a 69 track edition of over two hours of Raymond Scott's unreleased electronic recordings from the 1950s and 60s. In 1946, Scott formed Manhattan Research Inc. (MRI), billed as Designers and Manufacturers of Electronic Music and Musique Concrète Devices and Systems. His colleague Robert Moog said, Scott was definitely in the forefront of developing electronic music technology and in the forefront of using it commercially as a musician. Soothing Sounds For Baby was just a warm-up. With MRI, prepare yourself for something beyond the pleasant parameters of pop. Scott's electronic experiments took him to uncharted netherworlds. The results are intriguing, compelling, and often far ahead of their time and ours. The personnel on MRI consists of such Scott inventions as the Clavivox, a keyboard theremin that was later modified to produce an array of sounds similar to a synthesizer; the Electronium, an instantaneous composition-performance console (conceived in the '50s, developed in the '60s, used at Motown in the '70s); polyphonic sequencers, including his Circle Machine ; the Rhythm Modulator; and the Bass Line Generator; along with existing sound devices (e.g., the Ondioline and tone generators). The recordings range from detergent jingles to decidedly non-commercial -- uncommercial, even -- experimental adventures in sound sculpture. Aside from several samples of Scott re-tooling old titles (e.g., 1937's The Toy Trumpet and Twilight in Turkey), the remainder is new material. Also included, for the first time in commercial release, are several mid-1960s film soundtrack collaborations between Scott and Jim Henson. Having been rated by everybody from Coldcut to Radiohead as one of the most important works of electronic music ever released, Manhattan Research Inc was listed in pretty much everybody's top 10 listings for the year 2000 when it originally came out on CD. Absolutely stunning.